Shrimp Curry Rice Salad makes an easy potluck side dish. This winner was a recipe given to my grandmother by grandpa’s Commanding Officer at Barber’s Point way back in the day. One of the most talented home cooks in our family was Flo. As the wife of a naval officer, she travelled the world, enjoyed the flavors of many lands and developed her skills in the kitchen. This recipe for Shrimp Curry Rice Salad was given to her by the wife of my grandfather’s Commanding Officer at Barber’s Point. A tasty side dish for your next potluck. In a small bowl, whisk together mayonnaise, lemon juice, French dressing and curry powder. Set aside. 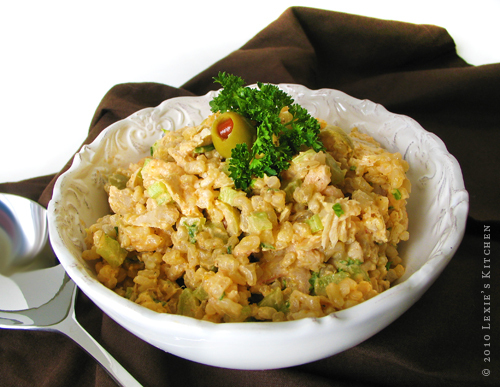 In a large bowl, gently toss rice, shrimp, tuna celery, parsley and green olives. Stir dressing into rice mixture just before serving. Looks very yummy! We are off shrimp, though! Long story. I will substitute seared "poke" (poh – key), a Hawaiian version of fish sushi: diced raw tuna with lots of green onion and seaweed. Different styles of poke are sold in Hawaii's grocery stores. I prefer to pan – sear the poke, then chill (instead of eating the raw sushi).